Tree surgery encompasses anything from pruning small branches on your favourite fruit trees to major work on a massive oak or elm. The bigger jobs can be extremely dangerous, since they involve the use of machines like chain saws which of course can be lethal in the wrong hands. Unfortunately, even experienced tree surgeons can have accidents, which is why we take the utmost care whenever we undertake any tree work. 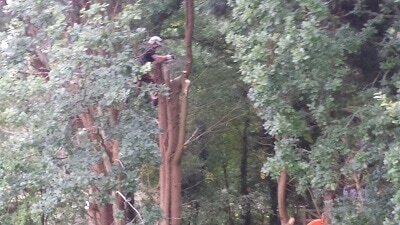 Horsham Tree Surgeons are fully qualified professional tree surgery experts who want to live long healthy lives! So we ensure our equipment is functioning properly and we take no chances with silly balancing acts or unsafe practices. And naturally we’re fully insured for your peace of mind. Before we even start work, we’ll assess the situation and work out how to tackle your tree work. It’s important to take into consideration the situation of trees: whether they’re adjacent to a highway or close to your house or whether their roots could affect your drains, for example. It’s not just a question of lopping off branches and hoping for the best! Once we have a plan of action, we’ll use all the appropriate safety gear, including harnesses, ropes, helmets, etc, to tackle the job in the most efficient and safest way. We work systematically, clearing up as we go and chipping trees as appropriate. When we’ve finished the job you’ll be pleased with how we leave your garden or site. We can remove tree stumps completely or leave partial trunks for craft projects – whatever your choice. And we can cut your wood into logs if you’d like wood for your woodburner or open fire. When it comes to pruning, crowning, or other skilled tree surgery, you want to know that you have experts who know where and how to cut – and also when. It’s all very well lopping off branches here and there, but an amateur can do a lot of damage that way. Trees take a long time to grow so you want to ensure you leave them as healthy and attractive as possible because any damage can take many years to grow out or could even cause irreparable harm to your tree. That’s why it’s worth employing a good tree surgeon to take care of your precious trees. In our experience, it’s not difficult to find someone to carry out tree surgery in Horsham. Although there are some brilliant tree surgeons, there are a few who are unqualified and will not do a competent job! Beware so-called “tree surgeons” who knock on doors touting for work; they may not be what they seem. That’s why it’s wise to choose an experienced team who will take great care of your trees rather than killing them. Look for a company with great reviews or ask friends for their recommendations. We work for many customers who have come through personal recommendation and remain with us for years. You can call us on 01403 371980 or simply fill in the form and we’ll be in touch shortly.